Software consists of a FRONT END and a BACK OFFICE. The back office part is used to set up product and price data and screen layouts, and then to see sales data and management reports. The front end is used for selling and can also be used for stock and waste management and ordering to suppliers or head office. 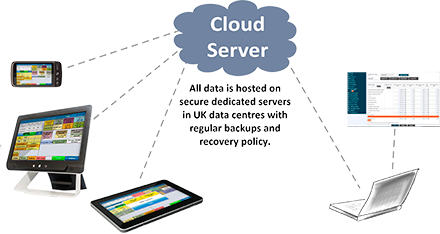 AlfaRichi has a web-based BACK OFFICE so there is no need for a dedicated back office computer or server, no expensive IT maintenance costs and no worries about backing up data because that is done by us. The back office is accessed from any computer, tablet or smartphone using a web browser and sales data from all shops is available in real time. Our software can run on most existing EPOS hardware or we can provide new hardware as needed. No server needs to be installed and maintained on your side. All data is stored and backed up on our secure servers. All data and product setup is available online via web browser. No software installation is required and you can use any computer or mobile device to see the data. It can be desktop, laptop computer, android touch tablet, Apple iPAD or even smart phone with internet browser. Google chrome web browser should be used. Whether you have 1 shop or 100 shops, the software and the way to use it is the same. Adding a till or a shop can be done in minutes. The system supports an unlimited number of named price plans, discount and promotion plans, layouts and ordering plans, and these can be used in shops as needed (different shops can use the same or different plans). You can manage retail shop or restaurant sales together with mobile sales. All reports were carefully thought about to enable you to see pertinent data and help you to increase profit, optimise stock and reduce loss. You will be able to make strategic decisions based on correct up-to date information structured in an optimised and easy to read way. When needed, you also have access to detailed information down to individual transactions by individual staff members. Unlimited number of web users can be set up, each with different login name and password. For each user it is possible to define which units (shops, mobile units, wholesale customers) are accessible and which features/reports are available. Access can be limited to read only or write access can be given to selected areas such as pricing, product creation, layouts, order plans, order adjustment etc. All tills and terminals communicate in real time with the data servers and you access up to the minute sales and stock data. Sending new prices, promotions, discounts etc. to multiple shops can be done in less than 1 minute. Updates can also be scheduled in advance to be done, for example, when shops and offices are closed. Ordering can be done on the tills or Android tablets based on ordering plans. Ordering plans describes which products can be delivered on which days and what are the order days and cut off times. Wholesale customers can place orders directly on line or you can take orders over the phone and enter them yourself on AlfaLine. Suggested orders based on previous week’s sales and waste. Multiple pricing plans are possible and each one has separate eat in and take out prices and VAT codes for each product. All Staff details are entered centrally and each staff member can be set to work in one or more shops. The same login details are used for each staff member in any shop where they are able to work. There are different passwords for those staff that can access management functions. AlfaLine reports show detailed operations for each staff member as well as a summary of the total number of sales, cancels, voids, etc., per staff member to highlight the best staff and to reduce theft.